I stumbled across what I was convinced must be the coolest Canadian Tire in all of Canada on Google Maps. Located at the end of one of the main streets in downtown Paris, Ontario, is a three storey heritage building which was occupied by a Canadian Tire until about one month ago. 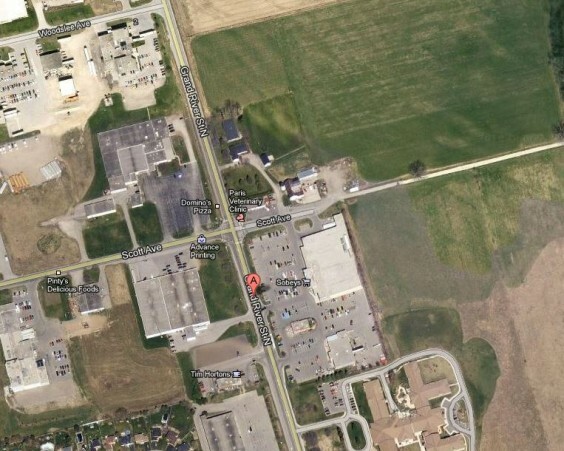 Sadly, the Canadian Tire was just moved to a greenfield site on the north end of town. Somewhere among this sprawl and farmland is the new Canadian Tire location. But wait, it can now offer all its products on one level and has more seasonal items! Yea that’s great, but its not going to do the downtown any favours in the short term. Paris is fortunate enough to have a strong tourism market, and their downtown BIA sounds very engaged, so I hope they can transform the space into some sort of market or artisan space. Canadian Tire, this is 2013… but you seem to be stuck in the mid-90s. and yet at the same time, Canadian Tire’s own research has found that smaller stores are more productive, and they are planning to open “express” stores of about 10,000 sq.ft. (or 1/4 size of typical). I suppose they will differentiate their business practice between larger urban centres with significant competition and smaller communities where they may be the only game in town. Yea exactly, I guess there is little incentive to think this way in a smaller community. I know it makes operational and financial sense to move to the greenfield site – but I still think its a lame move. My question is how did they end up in that building downtown in the first place?